The soprano, Raina Mihailova, was born 20 September 1915 in Ruse. Beginning her musical studies as a violist, she graduated from the State Academy of Music in 1939 as a student of Christina Morfova and Ludmila Prokopova. Between 1936 and 1939 she was a choir member and soloist with the Christina Morfova Choir. 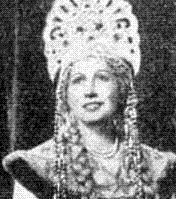 Additionally she performed operetta roles with the Sofia Odeon Theater during the years of 1937-39. Her debut with the Sofia Opera on 17 December 1943 was as Marenka in the Bartered Bride and from 1944 on performed the major lyric soprano roles. Along with her singing career she worked as an official with an insurance company until 1944. She was a regular performer with Radio Sofia. In 1950 she was awarded the Dimitrov Prize and in 1958 the Hungarian Medal for Art. International appearances took her to Yugoslavia 1946-48, Hungary 1947, USSR 1949 and 1956, Poland 1950, Czechoslovakia and Albania. Major roles in her career included Butterfly, Violetta, Marenka in the Bartered Bride and Antonida in Ivan Susanin.